When you step into the gym, you probably have some concrete goals in mind. You may want to build muscle and “tone up” to improve your physique, get strong enough to do 50 push-ups, or decrease stress. While exercise is a great way to accomplish all of these things, it also benefits your body below the surface. In addition to building muscle strength, reducing fat, and boosting your mood, working out can improve your bone health. How Does Working Out Improve Bone Health? While building strong bones may not seem as important as developing defined biceps right now, it is extremely important for health in the long run. Unbeknownst to many, bones are actually made of tissue that breaks down and regrows regularly throughout your life. You have the ability to build stronger bones and increase bone density, which is measured by the mineral content in bones, similar to the way that one would build their muscles. But, as we age, our bones naturally lose density. The lower one’s bone density, the higher their risk for osteoporosis. Osteoporosis is a condition in which bones become very weak and brittle, and more likely to break. Someone with osteoporosis may experience fractures from simple actions like bending over or even just coughing. The risk of osteoporosis increases with age, especially if bone health is ignored earlier in life. As you age, you lose bone density faster than you create it, and it becomes increasingly difficult to improve bone health. That’s why it is important to focus on bone density, no matter your age. Eating a balanced, nutrient-dense diet will fuel your entire body, including your muscles and bones. Calcium, vitamin D, and vitamin K are thought to be the most important vitamins and minerals for bone health, although supplementing with extremely high levels of them has not been shown to be beneficial. Rather, focus on eating a variety of healthy foods like vegetables, protein, and high-quality fat to get a balance of vitamins, minerals, and macro and micronutrients. It is always better to get a variety of nutrients from food rather than over-supplementing. There are numerous reasons why smoking is a bad idea, one of them being that it is bad for bone density. According to the National Institutes of Health, there is a direct relationship between smoking and decreased bone density. While this may be due to other lifestyle factors that are common among smokers, the NIH still recommends quitting smoking as a way to improve bone health and reduce the risk of fracture. Additionally, excessive alcohol consumption has been linked to a higher risk of fracture, and interferes with calcium balance and absorption. So, keep alcohol consumption to a moderate level. Another great way to increase your bone density is by strength training with weights. When you practice strength training, you activate the muscle as well as the bones underneath, as your muscle uses the bones to help support the movement. 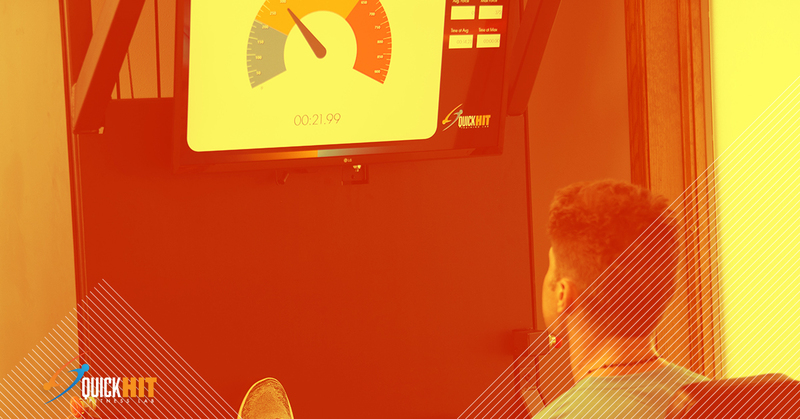 High-intensity training- the style used at QuickHIT Fitness Labs– is particularly beneficial for bone density, as it works muscles to failure and puts a lot of weight on the underlying bones. Be sure to focus on different areas of the body on different days, so that all of your bones reap the benefits of weight-bearing exercises. If you prefer workouts like swimming or cycling, it is great to continue those things, but you should also incorporate strength training to build bone density and reduce the risk of osteoporosis. What If I Already Have Osteoporosis? If you are an older adult or already have osteoporosis, it is true that it is harder to build bone density. But, not all hope is lost. For these groups, isometric exercises are the way to go. Isometric exercises work your muscles through resistance, rather than relying on the gravity of heavy weight. The resistance still is great for bone health, but reduces the risk of injury for those with lower bone density. Scientific studies have proven the effectiveness of isometric exercises for building bone density among those with osteoporosis. The style of training and equipment used at QuickHIT Fitness Labs deliver a double whammy of strength training in an isometric style. This means that people of all ages can greatly benefit from working out at QuickHIT Fitness Labs. Those in the preventive stage of osteoporosis will build bone density with high-intensity workouts that push muscles and the bones beneath them to their limits. Older adults and those with osteoporosis can reduce the risk of progression of osteoporosis, and feel safe exercising with top-of-the-line equipment and personal attention from trainers to ensure that all workouts are being done safely and effectively. And, training sessions are done in a fraction of the time of other workouts. No matter where you are with your fitness right now, your bones will thank you for working out at QuickHIT Fitness Labs. To try our high-intensity, 20-minute workouts find a QuickHit Fitness Lab near you!